Spring is holding off a bit this year but it will suddenly arrive. Well and truly time to get your wardrobe organised!! 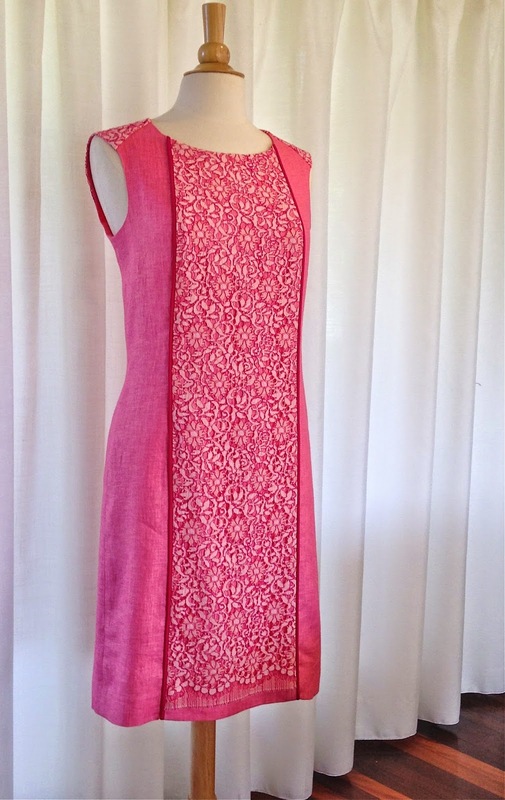 Rita added a layer of French Lace and a piped edge to this rather plain pink Linen. All fabrics used are available right now at alla moda fabric collection. Visit Kerrie and Jan; they'll be happy to assist you!! 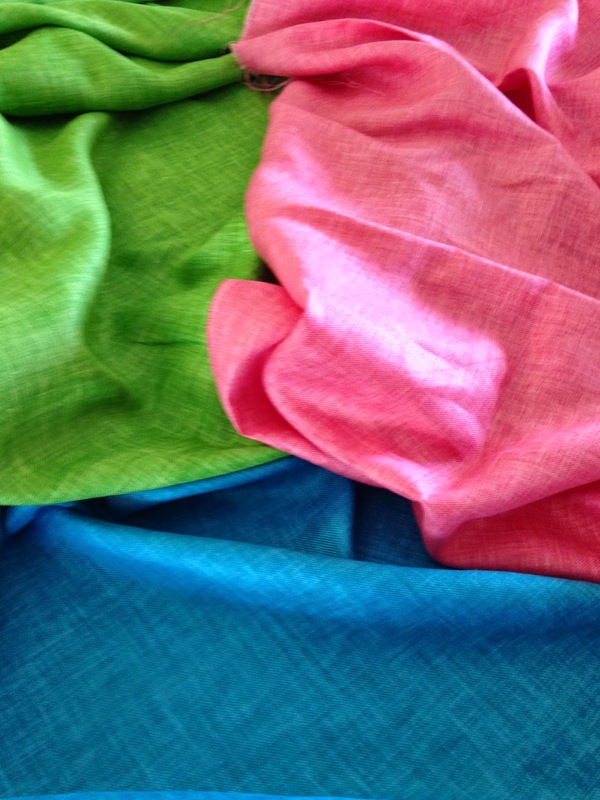 These colourful linens have just arrived, fresh from the looms in Switzerland. Don't miss out!! Join us on facebook today! Saturday 13 September and Sunday 14 September 2014. Alternatively, I can offer classes on Monday 15 and Tuesday 16 September, should the weekend already be booked with other activities. Please let me know if you're interested to join us; I'd love to hear from you!! Spring is just around the corner in Brisbane, Australia. I used an English Lace for this outfit made of 100% cotton and perfectly suitable for our summer weather. The lace came in white and I had it dyed to a mauve tone. 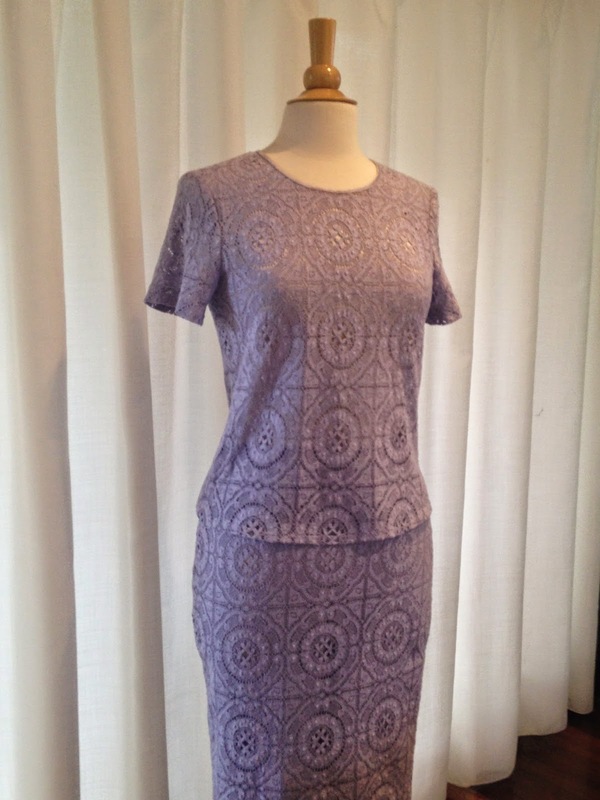 I chose a very simple style for the top without darts and a straight skirt. There is a fair bit of matching to be done because of the checks but the lace sews really well and I had no issues using the walking foot. Please contact Kerrie and Jan for further information; they'd love to hear from you! Or simply send them a note on Facebook. Yet again, I was inspired by another 1960's creation and set to work. 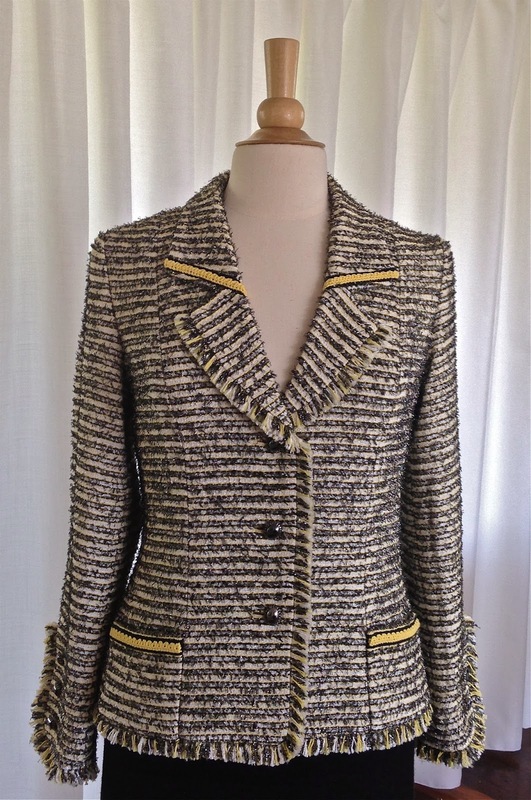 As always, Linton Tweeds provided the perfect Tweed for the creation. I used a pure wool that didn't require any matching!! Once I know in my mind how to tackle the "Brandenburgs" I was set to embark on this project. The hand sewing was never ending and required the patience of a saint, so to say. I matched the jacket with a very simple shift and wore the outfit to my daughters' graduation in July. Spotty Italian Silk makes the perfect partner! I used a spotty Italian Silk to line the jacket and it brightens up the whole garment. Beth Wyn Fabrics in Brisbane stock an extensive range of silk prints. Visit Joy and Barbara upstairs behind Roses and they'll be happy to help you! 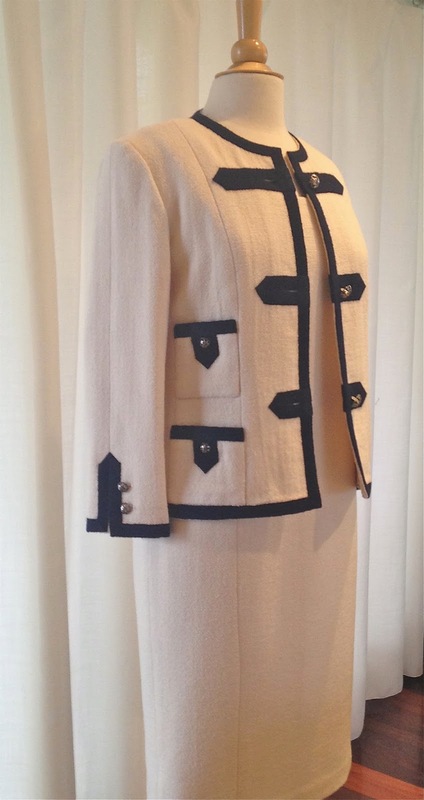 My latest Chanel Style Jacket is completed. I used a cream/charcoal/yellow combination and added a lapel to it. 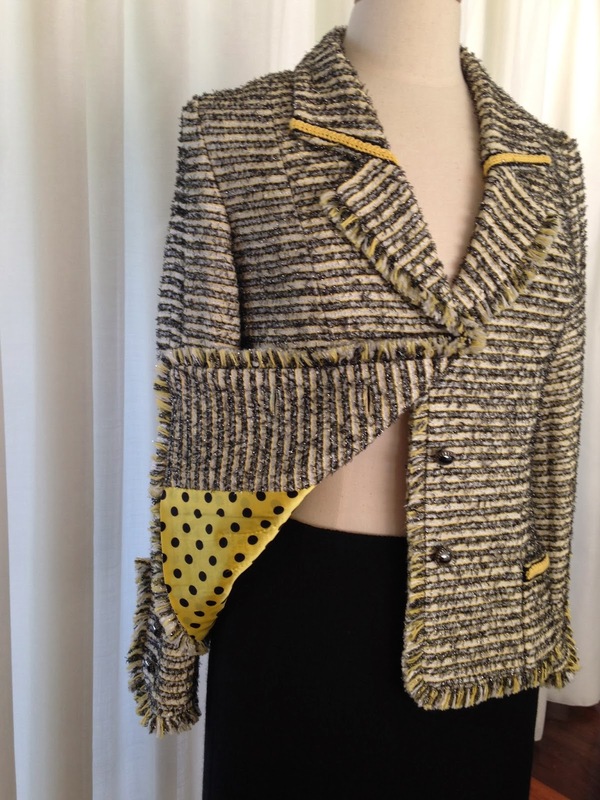 I fringed the jacket and embellished it with a yellow hand crochet braid. The Tweed is available at alla moda fabric collection in Brisbane and they stock a lovely range of other Tweeds too. Give Kerrie and Jan a call or better visit them in their shop at the Emporium in Brisbane. For the enthusiastic sewers I run regular workshops in Brisbane. Please contact me for further details, phone 07 3300 3470 or via facebook. Happy Sewing!